Here are the reviews left by our guests, who have stayed at “the little house“, benefit of all those who want to make a more informed choice for their stay. We therefore suggest to all those who will be our future guests to leave a comment. Stay for 10 days from 18 Agosto.Dopo few hours after our arrival,seemed to have entered the house of friends from old time, refined setting, but small garden with unusual plants, free cleaning and much cordiality’ Miriam (Dutch, multilingual) and Lino (maddalenino). Elegant people, in all respects, and tasteful that they sent to their B&B. Every morning we had a “sensory experience” in making breakfast; good and tasty, colorful and surprising for creativity’ Miriam. A week after the middle of September. Just like home, welcoming environment. Miriam and Lino treat all guests as perfect and with great distinction. Only to be a b&b. Sought in the choice of details. Great advice for boat trips and not. 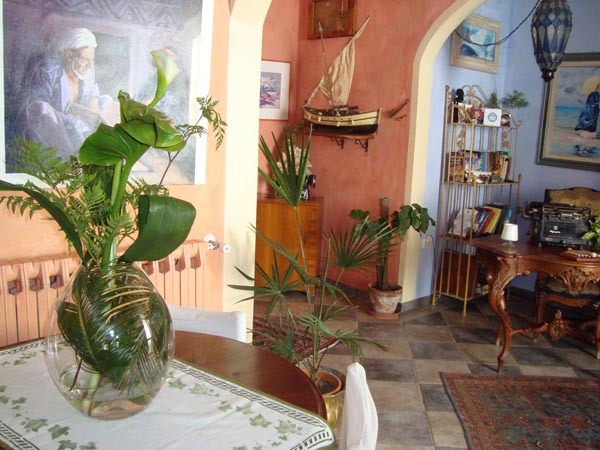 It’ a wonderful bed and breakfast especially for the kindness of the people who inhabit it, and the very nice parrot Pilù and likeable Chicca the dog. Certainly recommended, also for the delicious and colorful lunches Miriam. Small but very nice b&b. The hospitality of the owners is outstanding. 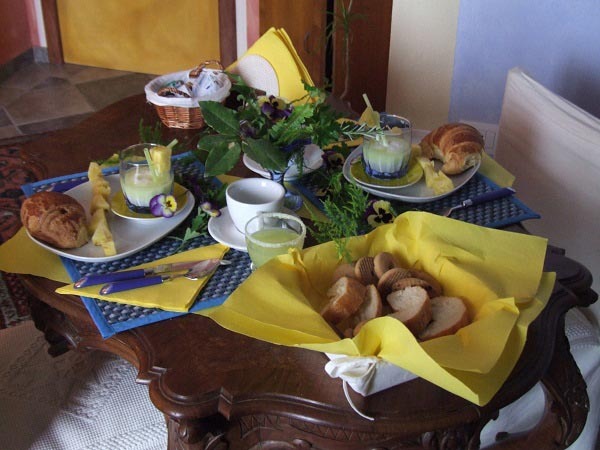 Not to mention the creativity with which Miriam, the hostess, surprises you every morning at breakfast. 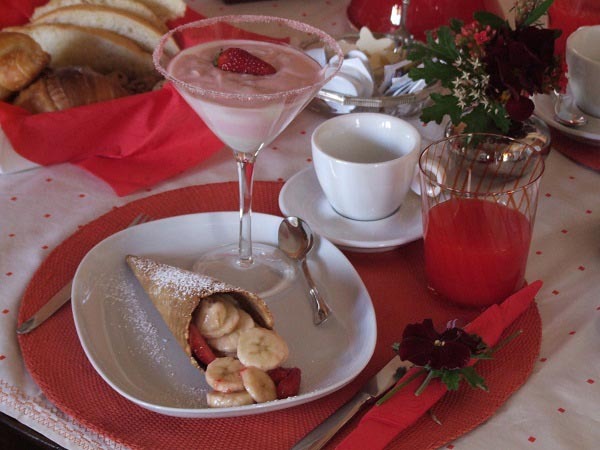 Fruit, yogurt, cookies, pastries…but also omelets and eggs prepared magnificently by Lino. 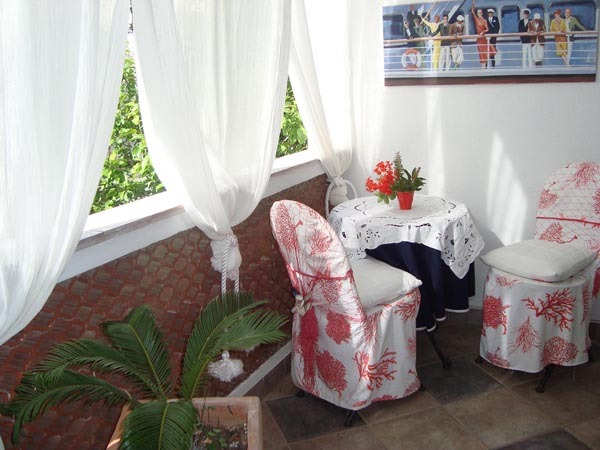 Clean rooms, carefully decorated with special, very quiet and in a great location. If we add the sympathy of Pilù, the parrot, English speaking, then you seem to really signing dipped in one of the magnificent paintings by Lino. 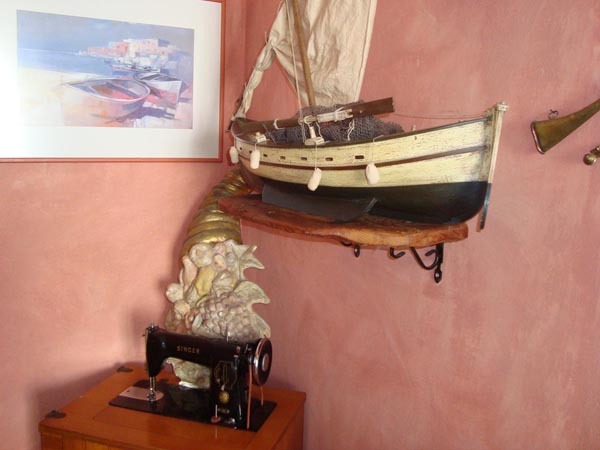 For us the stay with Miriam and Lino in “La Petite Maison” is perhaps the best thing about the whole trip in La Maddalena. The island's beaches are beautiful, but during our stay 4 nights on the Island in early July, the weather was cool and breezy. 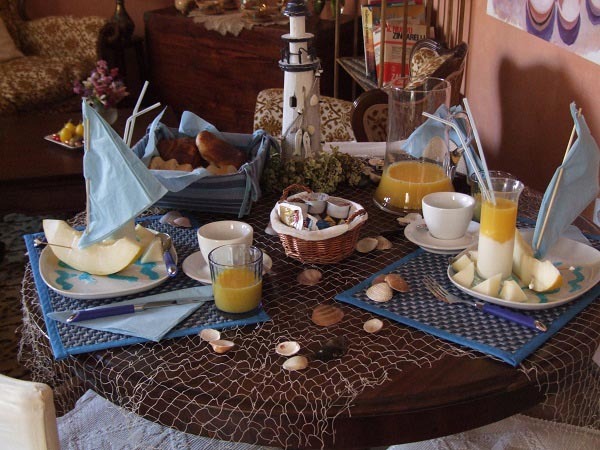 We still enjoyed the beaches, and we loved the charming decor, breakfast delicious and creative conversations with Miriam and guests “La Petite Maison”. The house is not huge, but the rooms are not small. I believe there are only three guest rooms. We had a room with a private bath isolated and we never saw another guest. The room was very quiet, clean and relaxing. The works of art are all over the house, is beautiful. I believe that Lino has created most, if not all the paintings he himself. The holiday was very nice, some strong winds out of the hotel. 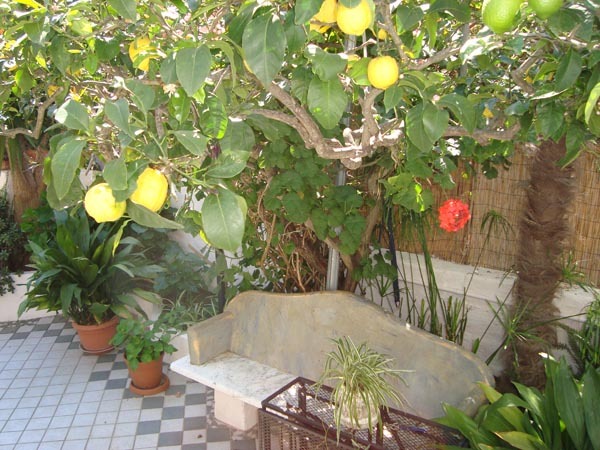 I would recommend La Petite Maison for couples looking for a private and relaxing stay when visiting La Maddalena. It’ an exceptional place. My husband and I stayed at “the little house” to 3 nights in early June 2014. La Maddalena and the other islands are beautiful! And our stay at the b&b was beautiful. 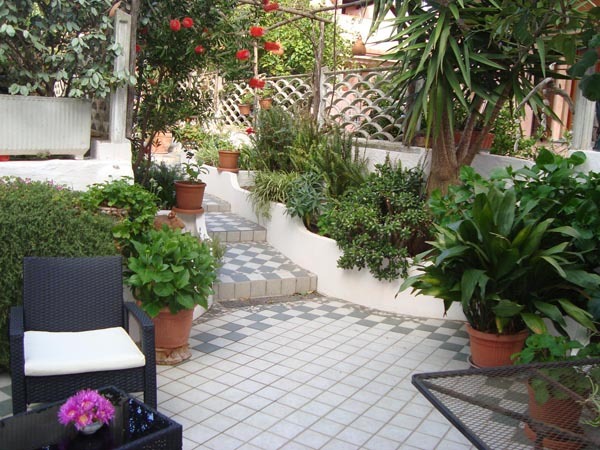 In my memory I remember the kindness of the owners and the soft, quiet atmosphere of the house and a small garden. A great attention to detail (I never expected to have three different sets to the table for each of the three delicious breakfasts) and, once again, Miriam and Lino who know how to make you feel a special guest. In Addition To: everything was in order and clean and we note that it is possible to reach the center of the city on foot. 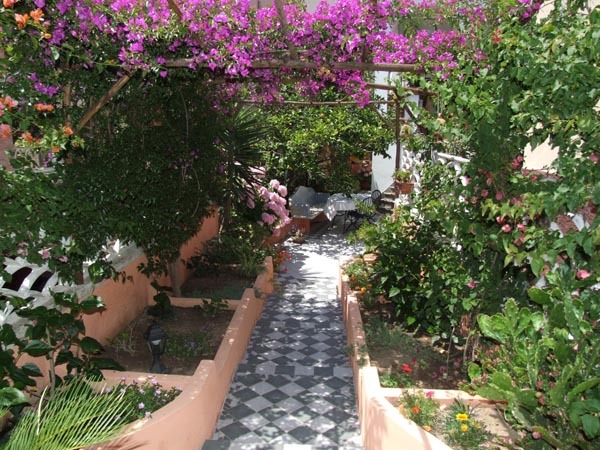 Therefore… Do not hesitate: book and enjoy Miriam and Lino b&b!! 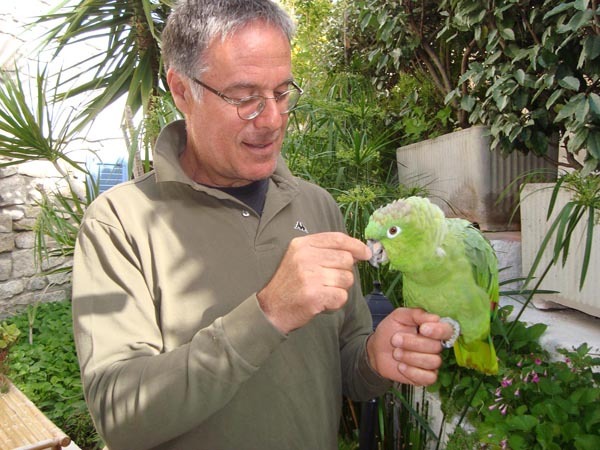 Me and my girlfriend stayed + parents in law with Mirjam and Lino + Pilu parrot. The breakfast was a real thrill every day. A theme and made with love for detail. Mirjam and Lino are friendly and helpful to talk. Great place to stay! 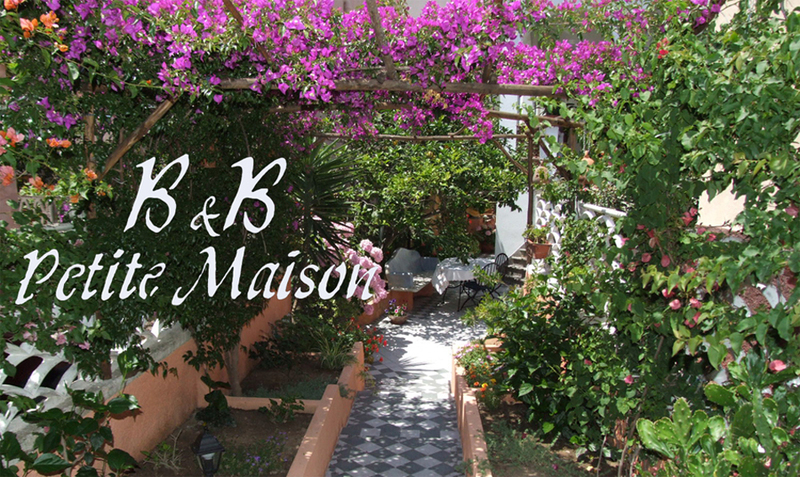 The hope is to return to the B&B Petit Maison maybe in September. Lino and Miriam treated us like friends, hospitality, sympathy, availability and love for their land are what they have been able to send! 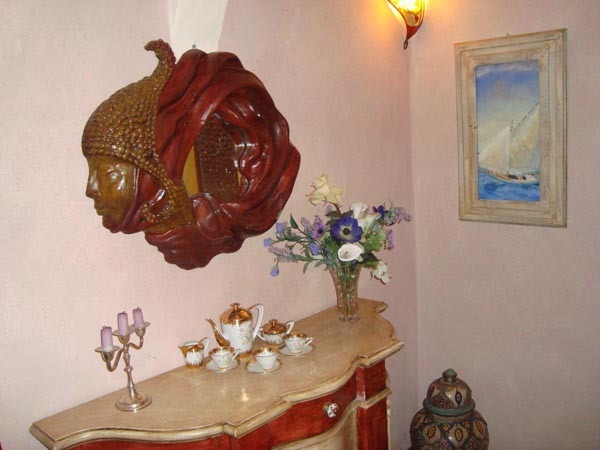 We can not help but we also quote the colorful supercolazioni Miriam and the warm embrace of bedrooms. Thanks Lino, Miriam, Saw, Kiki e …. Oliver!! We were there for the first three days of our vacation and the petite and hospitality of Lino Miriam maison, proved to be the perfect start arrived in La Maddalena. Breakfasts refined Miriam to start the day and the b&b well placed for exploring both the madeleine that Caprera, beautiful island adjacent: all OK. It's a little’ hard to find, but once you're there, what sforzone worth. We came up from Olbia, we took the bus to get to Palau and then the ferry to La Maddalena. Which, we rented a scooter to explore this beautiful island. Miriam was a great “mom” and she took great care of us. The breakfast is amazing and we loved the little details. 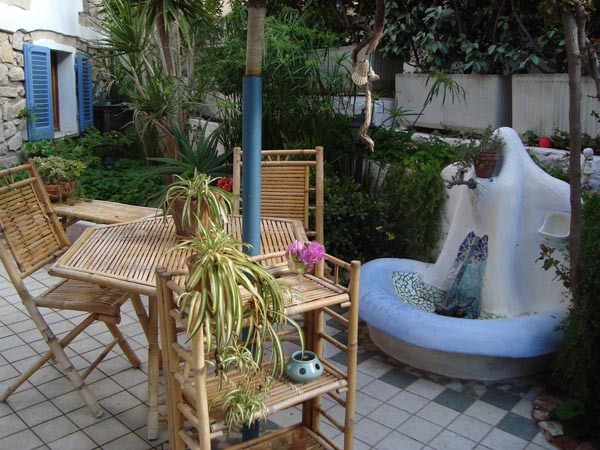 When we entered the small but important garden, She immediately made us feel welcome and offered us a coffee. 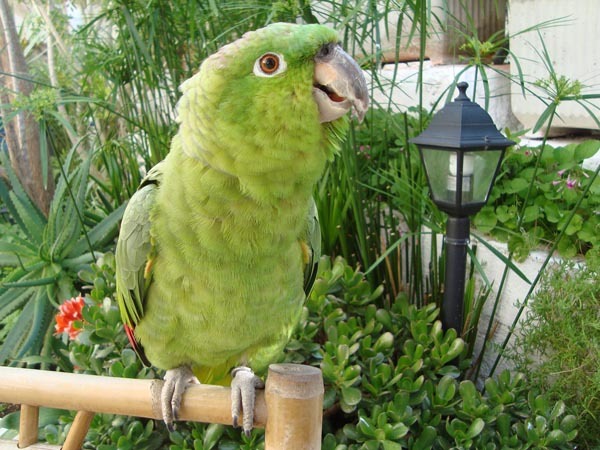 Linen, her husband, is an artist, a sweet man… is the only parrot that wakes you from this “dream” with open eyes. Highly recommended!!! Ps: for fresh fish – check out La Baracca east of city / for an afternoon snack and great views – definitely go to the beach of Punta Tegge west of the city ! As we have been good from Miriam and Lino! 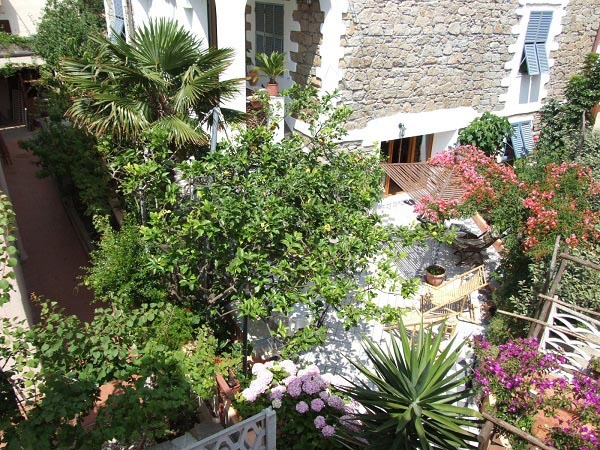 Only 3 rooms, arredate with taste, quiet place, with a landscaped garden and flowers, where the creative hostess serves incredible breakfasts. 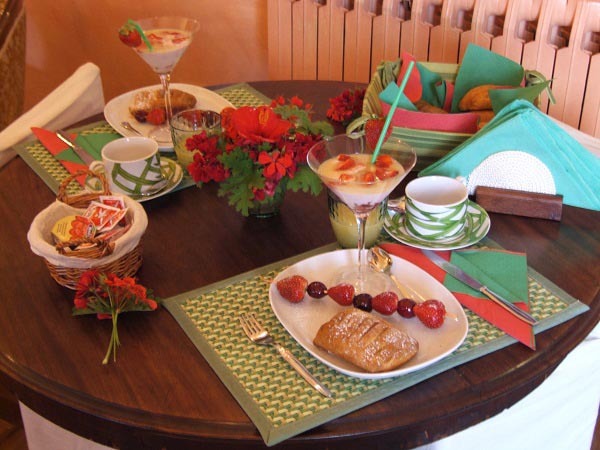 Fruit, fresh croissants in the oven, smoothies and yogurt prepared with care and with choreography every other day. It was our base for a week to discover the wonderful sea island. We hope to return! The great heart of Miriam and Lino, grande l’ospitalita’, Great amazement every morning in front of the breakfast, great the goodness of juice, la frutta e i croissant, mostly the sympathetic, The great fact to make everyone feel at home even if you are coming from various parts of the world, great ability to communicate in many languages, the great fact of living is the breakfast as a moment shared between all guests and with Miriam and Lino, with the parrot and the dog, large rooms and comfort (perfect weather and all the amenities'), great taste in decor, Finally, the great displeasure for having to leave, but the great hope to return soon! They were the 9 Best vacation days this year, I would really like to go back again with my family. The superior room is beautiful and very large, with comfortable beds and comfortable and the breakfasts are brilliant and colorful Miriam. Special mention to the parrot PILO (joy of my daughter) and the landlord, indisputable talent and source of good advice. See which rooms travelers: Wanting to have more privacy (and bathroom in room) it is advisable to opt for the superior room. This B&B is really well looked after. Every place has its own soul. The location is good, near the center but away from noise. The room we stayed in did not have a bathroom inside, but I must say that we really enjoyed the same, although I usually try to avoid this option. 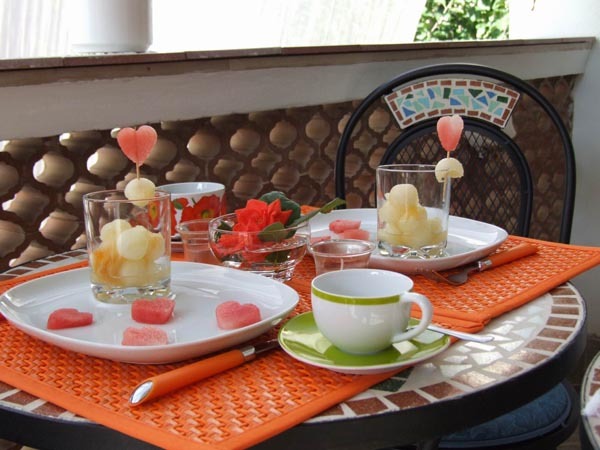 Miriam prepares breakfast with delicious and delicate fruit juice prepared by her, being careful thousand details. The morning after attending a “a little” between me and my girlfriend for the largest brioche, Miriam did prepare a donut with double cream (without my knowledge, and in accordance with my girlfriend). The two have enjoyed the scene while trying to stem the cream from all sides…making comments about my lack of elegance. Good and nice. 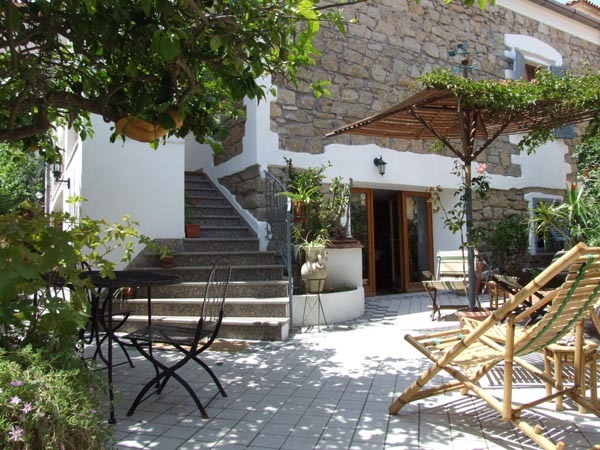 With some friends I spent two nights in the beautiful b&b small house della Maddalena. The location is strategic, a 5 minute walk from the center, away just enough to sleep peacefully and find parking. 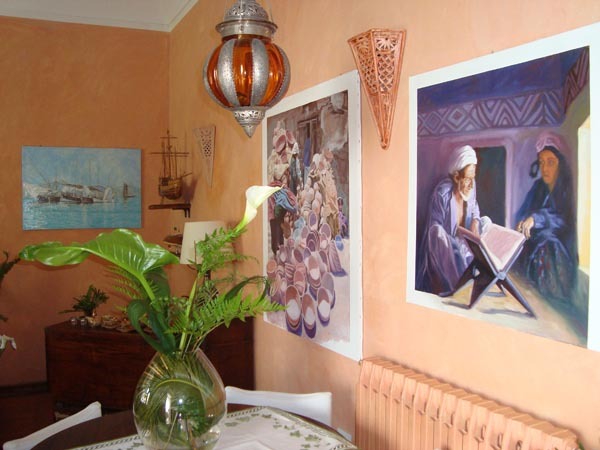 The superior room is very large, spotlessly clean and decorated with taste and art. I also saw the orange one and it seemed just as nice! The breakfast prepared by the legendary Miriam in the beautiful garden full of flowers is spectacular: the table decorations are inspired every day to a different theme (to us it happened on the first day and the second Africa Amsterdam) and the food is great (brioches fresche, cookies, bread, donkey, jam, fruit, yogurt, fruit juice). Che relax! Il sig. Lino also gave us valuable advice on the beaches to go and its paths. I highly recommend this to all b&b, and hope to return soon! There is everything, but everything, what you look for when you are on vacation: courtesy, education, cleaning, sympathy in a fabulous place!